This stay was perfect. Thanks for the great time I had here! We stayed for five nights at this hostel, we had a private double room. The room was in a different building, but this was not a problem for us and the location was even more central than the main building. Although our blanket lost most of its feathers, the room was clean, the shower was great and the breakfast was more than adequate! In total we had a very pleasant stay! Really nice hostel and very helpful people working there! Lima was the first stop of trip and they were very kind and helped me out by organizing the next part of my trip. Not a party hostel but still a nice atmosphere on the rooftop. The private rooms are at a separate location (without proper bar), in the primary building the atmosphere is really nice! 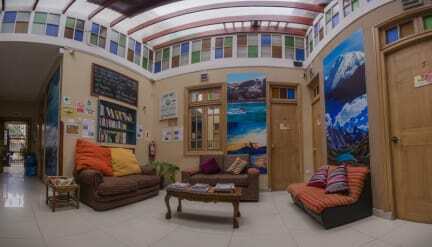 Lovely hostel in the center of Lima and literally a 2 min walk from the beach. Big supermarket around the corner and kitchen facilities. Further, the hostel has a chilled out rooftop teras where all guest chill and meet. I think the best part is the people working in the hostel. They remember your name, take time to get to know you, and even after shifts come socialize at the bar. It is like having a local guide and friend. @Jhemm and the rest, cheers and lylt. Very friendly staff, good breakfast, nice location near the ocean. Leuk hostel met goede locatie. Badkamer was vrij oud maar verder prima verblijf gehad!